I have been building plastic scale model assembly kits of aircraft, missiles, AFVs and ships (mostly in 1/72 scale) for more than 54 years. If no 1/72 scale assembly kit of a subject in which I'm interested exists, then I'll attempt to scratchbuild it. The Atomic Cannon model shown on this site is my most ambitious scratchbuilding project, to date. Pat Gaertner, my first wife of 44 years, continues to patiently tolerate my relatively harmless interest in drably-painted machines that blow other machines up. If you want to forward this site to anyone, you can do so by clicking on the "Email this Site" button below. 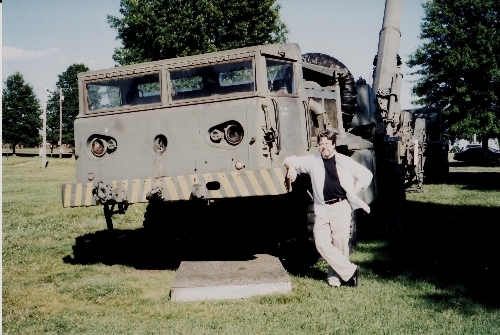 That's me in 2000 (you can tell by the not-as-grey hair and relatively-trim waistline) pushing over the M-249 Front Truck at the AFV Museum at Aberdeen, Maryland. Picture courtesy of my able assistant-AFV-researcher and middle brother, Charles Gaertner.